I’ve just been out for my last run of 2013. A year ago, I posted both a review of 2012 and wrote down my goals for 2013. It’s time to do it again. I guess there are a number of ways I could review this year. I could go on feel, I could just look at results, or I could be terribly analytical (particularly now I’ve got all my data in TrainingPeaks I’ve got all sorts of pretty graphs to look at) – and I guess a well-rounded review should have a bit of all of those. A couple of months ago I read a short article with questions to ask yourself in a season review, so I’ll try using them to write this post! That’s hard actually; it’s been an amazing year. There are a few highlights to choose from, so to pick three: giving everything at Bristol Harbourside Triathlon, racing as a GB Age-Group athlete in Hyde Park, and winning my first triathlon at the HOWSC 100 in my last event of the year. In terms of racing stats, I raced 17 times this year (plus three parkruns!) about the same as last year, but whereas last year’s best result was a third place at Concorde Triathlon, this year I recorded three 3rd places, at Winchester Du, at Eastleigh Tri, and at Reading Tri, as well as the win at HOWSC. I also had two wins (race 1 and race 5) and two 2nd places (race 4 and race 6) in the Eastleigh Aquathlon series. I only managed 4th at Concorde though! Finishing mid-field in the qualification races at Box End, Nottingham, Bristol, and in Hyde Park shows what a step up there is to the national/international races. That’s easy: not qualifying as a triathlete for the world champs. Nottingham Triathlon was eye-opening from all sorts of points of view, and absolutely the best race I’d put together at that point, but I was still a chunk of time behind the qualifiers. I came back three weeks later at Bristol and got much closer, but still didn’t quite make it. I was gutted. Competing in the aquathlon at Hyde Park was awesome, but I’ve definitely still got ambitions to compete at sprint triathlon for the GB age group team. I set myself some overall goals: Train every week, 4-5 hours/week. Get lighter, fitter and stronger. Go faster. I hit the training time target and I definitely went faster, but as for lighter, fitter and stronger, it’s a bit of a mixed bag as my focus varied through the year in a somewhat ad-hoc fashion, particularly during the middle part of the year while I was racing frequently. On the running front, I wanted to beat my 2012 best 5k run time even at the end of a tri, and I managed that at the All Nations and was within a few seconds at my season ‘A’ race at Nottingham too. A sub-18 minute 5k has been frustratingly elusive but it’ll be a target for early in 2014. On the biking front, I knew that my usual speed wasn’t going to be enough and was aiming for a 10-15% improvement this year. I hit that target at Nottingham, with some assistance from new (second-hand) wheels, and went even faster at the TRI Challenge Team Triathlon. However, I was still a way off the pace of the qualifiers at Nottingham and one of next year’s goals has to be to develop the power required for a 40 km/h TT. Consistent training. At the end of 2012, I was really pleased to have managed at least some training every week; this year I can say that was just the norm. My volume is still very low by comparison to most competitive triathletes, so I’m just going to have to find ways to be cleverer with my training slots. Transition and race day practice. I got better (very much with Em’s help!) at dealing with race day nerves. 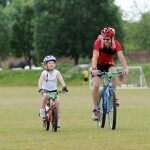 I got much better at transitions, following Richard Stannard’s eye-opening aquathlon masterclass. Core strength workouts, although not consistently enough through the season. I can feel the benefits in all three sports. Having Nic Harvey’s coaching on this, and help from Jill Penfold and Joe Allnutt with niggles and injuries, has definitely been worth it. What did you do in training this season that you feel was not productive? If you could change your training, mental preparation, or race tactics/strategy this past season, what would you do differently? As for race tactics/strategy, it’s only after having done the qualification races and started to regularly finish in the top few spots in local events, that I realise race tactics might be handy! 🙂 Up until now, like most triathletes I suspect, I’ve basically raced against myself and the clock. If I can build on my results next year, hopefully I’ll be racing against the competition more. I’m also starting to feel like I’d be spurred on by some club/group sessions. I wanted to join the Oakley Pedalers / North Hants Road Club rides when I wasn’t racing but almost every week I decided something else had priority. It seems a bit pathetic but I only managed two chaingang rides the whole year. I feel like I’d benefit from some coaching advice as well, both in overall planning and for each sport. Joining a tri club would be the obvious solution but it would add a significant amount of travelling to training sessions. On the other hand, individual coaching, in person or online, seems to be more expensive than I can afford. Do you feel that you trained enough and worked hard enough in training this season? 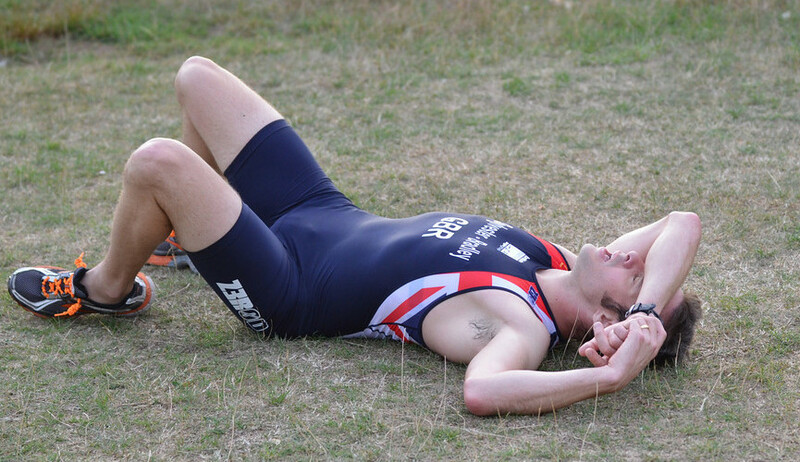 Do you feel that you had adequate rest during training and before races? Enough? Well… I (and my wonderfully supportive family!) put in more hours than last year, and I like to think there weren’t many junk sessions, but if you were to ask most age-groupers I suspect my volume is very much on the light side. However, Julian Middlewick reminded me that endurance sport improvement is measured over years not weeks, and I’m sure he’s right. To avoid overtraining, I’ve read in several places that increasing training volume for endurance sports by 10% per annum is a sensible target. Hard enough? I’m pretty sure I haven’t done enough high-intensity sessions, particularly on the bike, this year but that’s probably something else that requires gradual development of both the physical capacity and the mental strength. Rested enough? I played around with my taper through the year, varying how much and how late I reduced volume and intensity before races, and I think I found a good balance. I haven’t periodized my weekly training intensity except through accident though and I’m probably missing benefits here. One of the best things about the year has been sharing it with family and friends. 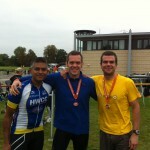 Andy and I managed to do several events together, and combine with Jon for the TRI Challenge Team Triathlon. Let’s keep it up! I thought it might be worth looking at 2013 in numbers, so I’ve done that. However, this post has become way, way, too long already, so I’m just going to sign off with a picture, before turning to 2014! This entry was posted in Uncategorized by garethsb. Bookmark the permalink.